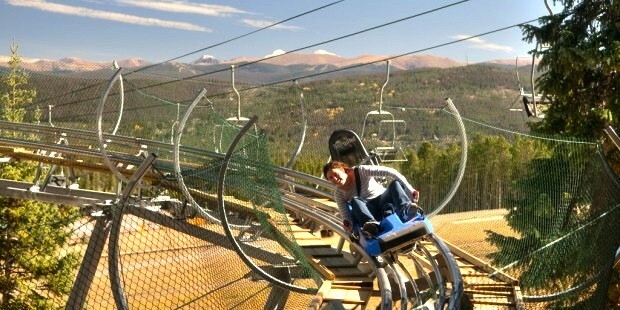 There’s still time to squeeze in the last bit of summer fun in Breckenridge! The Breckenridge Fun Park is just bursting with… you know… FUN! from the stuff for the little ones including the Toddler Zone and Ripperoo’s Bounce House to the more adventurous TenMile Flyer Zipline and the Gold Runner Coaster, to the fun for the whole family, including the snowfield, SuperPutt Mini Golf, mountain biking, and 4 x 4 off-road tours, there is never a dull moment. Then, to top it off, at the bottom of Peak 8, there are great places to it, and at the bottom of Peak 7, Sevens Restaurant awaits. And finally, when it’s time to call it a day, Grand Lodge at Peak 7 is a great place to call home. Casual luxury sitting at the base of Peak 7, with stunning views on the mountain peaks, and just a walk outside to the Independence SuperChair for catching a ride up the mountain to bike down the great trails, or in the winter, ski in, ski out access to some of the best skiing in the world. Grand Lodge at Peak 7 offers luxurious fractional real estate, but inventory is almost sold out. CLICK HERE TO SEE SPECIAL OFFERS ON REMAINING INVENTORY. These luxury condos range from studios to four bedrooms, but when they are sold out, the benefits of being an owner at Grand Lodge at Peak 7 are gone, including access to world class amenities like a salt water aquatics center, fitness center, day spa, sauna, steam room, hot tubs, a private theatre, concierge, and more. If you are not familiar with the benefits of buying fractional real estate, CLICK HERE for an explanation. It is also time to get your winter and spring break plans locked up, making the commitment to family memories that will last a lifetime. There really are just a few luxury condos left for fractional real estate purchase at Grand Lodge on Peak 7, and when they are gone, they are gone. If you have been looking, you really do need to move from looking to action right NOW. Luxury fractional real estate has so many benefits – all of the amenities with none of the hassle, deeded property (different from the time share model), and of course the benefit of a far lower price than purchasing a single owner vacation home in Breckenridge or the surrounding Summit County. This entry was posted on August 24, 2014 by elevatemarketingaz. It was filed under Breckenridge Colorado Luxury Condo Sales, Breckenridge, Colorado Real Estate, Fractional Ownership Real Estate Breckenridge CO, Fractional Ownership Real Estate Summit County Colorado, Grand Lodge on Peak 7 Breckenridge, Colorado, Luxury Fractional Real Estate Breckenridge CO, Luxury Fractional Real Estate Breckenridge Colorado, Luxury Fractional Real Estate Summit County, Colorado, Real Estate Breckenridge Colorado, Ski In, Ski Out Luxury Condo Breckenridge Co, Ski In, Ski Out Luxury Condo Summit County, Co, Ski In, Ski Out Luxury Condo Summit County, Colorado, Summit County Colorado Luxury Condo Sales, Summit County Colorado Real Estate and was tagged with Breckenridge Colorado, Breckenridge Colorado condos, Breckenridge luxury condo sales, Brent Henry Breckenridge real estate broker, Grand Lodge on Peak 7, luxurious condos, ski out real estate breckenridge colorado, ski_in_ski_out Breckenridge condo.